As the second and third largest economies in the euro area, sharing a border and a currency, France and Italy see their industrial sectors tending to move more or less together over time. The R-squared relationship between Italian manufacturing IP and French manufacturing IP is 0.53 from 2011 on. It is not surprising that these two large EMU economies move in a synchronous orbit. 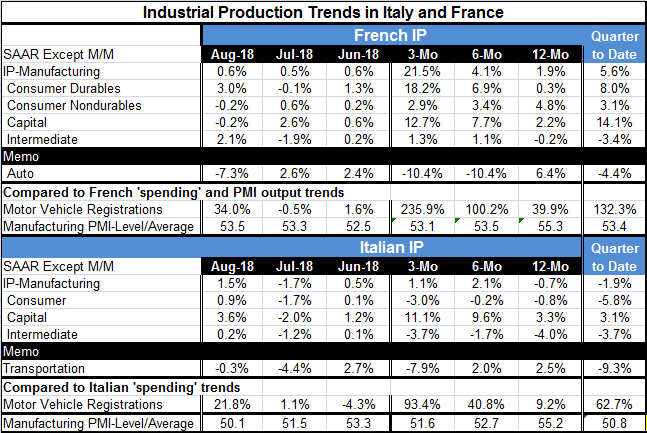 However, there are still differences in these two economies and those differences are emerging over the past month that correlation between France and Italian IP has fallen to an R-square value of 0.25. The chart shows how the overall IP growth rates in these countries are separating as weakness in Italy is coming on faster than in France. Since January 2014, the Italian manufacturing PMI has been stronger than the French manufacturing in 48 of 56 months. But four of those eight Italian underperformances occurred over the past five months. Not only is Italy weakening faster than France but it is weaker in PMI terms as well as in production growth terms. Weakness has been a common theme in the euro area. The IMF’s meeting this week extended that weakening to its outlook for the global economy, adding a caveat about deteriorating underlying risks and the potential for weakness to adversely affect the financial sector. France bucks these trends and shows industrial output is accelerating. Consumer durables and capital equipment are driving the acceleration. Intermediate goods are building some minor momentum too. Consumer nondurables are losing some traction on trends within one year. Italian trends within one year are uneven. Italian output declines over 12 months, makes a recovery over six months, then slows its pace over three-months. Consumer goods output is negative on all horizons. Capital goods output is accelerating. Intermediate goods output is declining on all horizons. In the quarter-to-date, French IP is rising at a 5.6% pace while Italian IP is contracting at a 1.9% pace. French auto production and transportation output for Italy both show fading output and demonstrate contraction in the quarter-to-date. So there is still some commonality in the two national trends for output. And both have increasing spending trends in play for motor vehicles as registrations are increasingly strong in both Italy and France despite the output cutback. However, the auto sector is not driving either of these two economies. The chart that displays year-on-year trends depicts both economies as engaged in some degree of slowing. The sequential growth figures are for trends for one year and less. While the longer profile shows that year-on-year growth rates are slowing, the within- one-year profile shows France accelerating and Italy growing slowly. Economic trends can be complex. Conditions which are a conundrum over a short period of time may simply fade into a longer run trends when given the broader perspective of history. This month’s divergence between the year-over-year growth rates has some unusual aspects but is still only the 13th largest divergence in the last 56 months, marking it as a top 23% event which hardly makes it very unique. While Italy’s IP is weakening more than and faster than France’s and while that has not been the rule in this recovery, it is also not such an extreme event. The political events in play make this divergence more understandable with the new Italian government seeking to use deficit financing to stimulate the economy and being opposed by the EU Commission. Italy’s real GDP is still some 2.8 percentage points below its level of Q3 2008 when global economic conditions were deteriorating rapidly. Italy still has not recouped its recession/financial sector losses. Only Italy and Greece, among the earliest EMU members, have failed to recoup their pre-recession levels of GDP over the past decade. Finland and Portugal each have seen GDP gain only about 1% net from their Q3 2008 level of GDP over the last ten years. Italy has been trying to shrink itself into a more competitive state, but with all the debt it has, that is not an easy thing to do. Italian banks are in rough shape and Italy is having a hard time getting growth in gear. Despite the fact that its manufacturing sector and performance relative France has been solid, that is not much of an achievement. Italy is looking for answers and hoping to fund some projects using public finances, but the EU Commission is slamming that door shut. This is an important time for Italy and for the EMU. Since Q3 2008, Italy’s GDP has been weak and the ratio of Italian to German GDP has fallen to 54.3% from 63.4%. In round terms, Italy is more like half the size of the German economy instead of early two-thirds its size. German GDP has grown substantially in recovery compared to Italy where economic size relative to Germany has lost nearly 10 percentage points. When a country like Italy has a huge debt load, it is very hard to regain fiscal probity and economic strength through fiscal contraction and slow growth. Italy is of the opinion that these German-led EU Commission rules have not worked and are not going to work. It is looking for a new way. The Commission is not inclined to do that. And that is going to be a point of real conflict because I don’t see how Italy will be able to repair itself on any reasonable timeline continuing on this same path. And that is Italy’s real problem and it has also become the EU’s problem. While everyone is looking at Brexit, the real EMU-busting issue is in progress in Italy.